Pyloric stenosis refers to a narrowing of the passage between the stomach and the small intestine. The condition, which affects infants during the first several weeks of life, can be corrected effectively with surgery. Frequent vomiting may be an indication of pyloric stenosis. 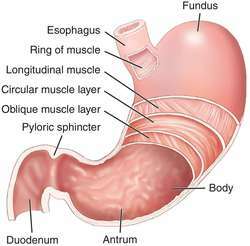 The pylorus is the passage between the stomach and the small intestine. During the digestive process food passes through the pylorus, which is located near the bottom of the stomach, on its way to the intestines. In pyloric stenosis, the muscular wall of the passage becomes abnormally thickened. This causes the pylorus to become too narrow, which prevents food from emptying out of the stomach in a normal fashion. The partially digested contents of the stomach are forced upwards into the mouth. 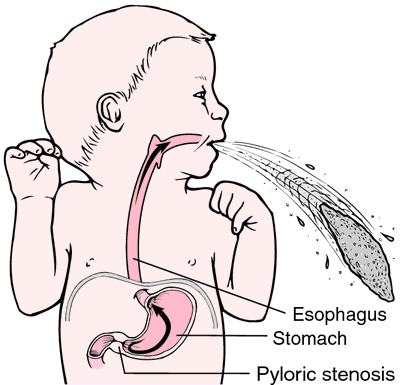 As a result, a baby with pyloric stenosis often vomits after feedings. The condition affects one in 4,000 infants. Most are diagnosed between three and five weeks old, though some babies may show symptoms during the first or second week of life. Infants with a family history of pyloric stenosis are more at risk for the condition, which tends to occur less often in females, blacks, and Asians. Pyloric stenosis is also referred to as hypertrophic pyloric stenosis. The cause of pyloric stenosis is not known. The main symptom is vomiting after feedings. These episodes of vomiting usually get worse over time, happening more often and becoming more forceful (forceful vomiting is often called "projectile" vomiting). Other symptoms include increased appetite, weight loss, infrequent bowel movements, belching, and diarrhea. Due to dehydration, the infant may also have fewer wet diapers. The clinician will examine the baby and talk with the parents about their infant's symptoms. If a child has the condition, the doctor should be able to feel a hard mass (about 2 cm wide and olive shaped) in the area above the bellybutton. If the doctor cannot detect the mass, ultrasonography will be done to confirm the diagnosis. A blood test may also be performed to see if the infant is dehydrated, in which case intravenous fluids can be used to correct the problem. Pyloric stenosis can be cured with a surgical procedure called a pyloromyotomy. In this operation, the surgeon makes an incision in the baby's abdomen. Then a small cut is made in the thickened muscle of the pylorus and it is spread apart. In this manner, the passage can be widened without removing any tissue. (The procedure may be performed with the aid of a laparoscope.) After surgery, the pylorus will heal itself. The thickening gradually goes away and the passage resumes a normal shape. The whole procedure (including anesthesia) takes about an hour. Most babies go home one or two days after surgery. Any mild discomfort can be controlled with Tylenol. The infant may still vomit occasionally after surgery, but this is not usually a cause for alarm. However, if vomiting occurs three or more times a day, or for several consecutive days, the baby's pediatrician should be notified. Surgery is often a complete cure. Most infants do not experience complications or long-term effects. It is not known how to prevent pyloric stenosis. Behrman, Richard E., et al., Nelson Textbook of Pediatrics. Philadelphia: WB Saunders, 2000. Yoshizawa J, et al. Ultrasonographic Features of Normalizationof the Pylorus after Pyloromyotomy for Hypertrophic Pyloric Stenosis. "Journal of PediatricSurgery" 36 (April 2001): 582-6. American Academy of Pediatrics. 141 Northwest Point Boulevard, Elk Grove Village, IL 60007-1098. (847) 434-4000. http://www.aap.org. Laparoscope — A thin, camera-fitted tube that can be inserted into the abdomen in order to view internal organs. Stenosis — The narrowing of a passage (such as the pylorus). Ultrasonography — A non-invasive imaging procedure that uses high-frequency sound waves. pertaining to the pylorus or to the pyloric part of the stomach. pyloric stenosis obstruction of the pyloric orifice of the stomach; it may be congenital, as in hypertrophic pyloric stenosis, or acquired, due to peptic ulceration or prepyloric carcinoma. The initial symptom is vomiting, mild at first but becoming increasingly more forceful. It can occur both during and after feedings. Diagnosis may be confirmed by x-ray examination using a barium meal. Treatment is usually surgical, involving longitudinal splitting of the muscle (pyloromyotomy). Congenital pyloric stenosis. The abnormal narrowing of the opening of the pylorus causes episodes of projectile vomiting. From Frazier et al., 2000.
narrowing of the gastric pylorus, especially by congenital muscular hypertrophy or scarring resulting from a peptic ulcer. See also: hypertrophic pyloric stenosis. a narrowing of the pyloric sphincter at the outlet of the stomach, causing an obstruction that blocks the flow of food into the small intestine. The condition occurs as a congenital defect in 1 of 200 newborns and occasionally in older adults secondary to an ulcer or fibrosis at the outlet. Diagnosis is made in infants by the presence of forceful projectile vomiting and palpation of a hard, prominent pylorus and in adults by x-ray examinations after a barium meal. Surgical correction is done with the patient under light general anesthesia after the stomach is emptied. The muscle fibers of the outlet are cut, without severing the mucosa, to widen the opening. After surgery in adults, a stomach tube remains in place and observation is maintained for signs of hemorrhage or of blockage of the tube. See also pyloromyotomy. Congenital hypertrophic pyloric stenosis, hypertrophic pyloric stenosis GI disease A narrowing of the gastric outlet into the duodenum due to thickening of pyloric muscle, which controls gastric flow to the duodenum; PS is more common in ♂; Sx appear shortly after birth. Narrowing of the muscular outlet from the stomach (the pylorus) so that the passage of food into the DUODENUM is obstructed. The condition may be CONGENITAL, calling for an urgent operation to relieve the obstruction, or may be acquired as a result of repeated attacks of ulceration in the area. In this case, PYLOROPLASTY may be needed. Pyloric stenosis is occasionally caused by cancer of the stomach. 2012) Bottle-feeding and the risk of pyloric stenosis. Transverse Pyloroplasty and Y-U Advancement pyloroplasty for the relief of pyloric stenosis in clinically normal dogs with special emphasis on the effectiveness of the procedures used in terms of easy approach, improving diameter of the pylorus, healing at the operation site and least post- operative complications of the procedures used. Even though the number of babies in the study was large, the number of cases of pyloric stenosis was small. Conclusions: There is a high frequency of ocular abnormalities and pyloric stenosis in infants with karyotye XO. Pyloric stenosis is a severe and potentially fatal condition in which apparently healthy in-fants, typically 2 to 8 weeks old, develop an inability to pass food from the stomach into the duodenum (part of the small intestine). Pyloric stenosis with reflux oesophagitis in a Thoroughbred filly. Q MY baby son has pyloric stenosis and is having surgery but I don't know what caused it? The second-most common cause of admission was for digestive conditions such as pyloric stenosis. He diagnosed a condition called pyloric stenosis, in which a valve flips back the milk, rather than allowing it to pass to the stomach. Pyloric stenosis is the enlargement of the muscle between the stomach and the small intestine, which prevents the passage of food and liquids into the intestines. He and his colleagues examined four patients--two with pyloric stenosis, one with oropharyngeal dysphagia, and one with a history of gastric surgery--in an effort to perform capsule endoscopy despite contraindications. He makes much of the fact (or delusion) that he--and perhaps the six other occupants of the decayed mansion--cannot move: "Under the terrible inertia of pyloric stenosis we tried to move no more than was necessary, movement was painful to us now, painful to us and to our home--too quick a movement might bring us down .